What is the Enevo sensor? It is a wireless device that uses state of the art diagnostic technologies to provide continuous monitoring and updates of litter and recycling containers. When the Enevo sensor is installed in one of your bins you will be able to monitor the current fill level, temperature, location and tell if the bin is upright. It then uses this data to generate an optimised pickup route. If you haven’t yet purchased your Glasdon bins and want to order the Enevo sensor as well you can request a quote on the bins product page. 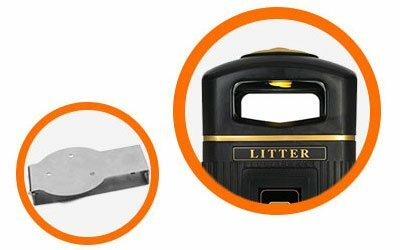 We will provide you with a price for the sensor and the bin with fitting bracket. Browse our wide range of Enevo ready bins by clicking below. If you have already purchased your Glasdon bins, don’t worry, you can still make use of the Enevo sensor if your bin is compatible. Contact our sales team and they will provide you with a quote for the easy to fit fixing brackets and sensors. 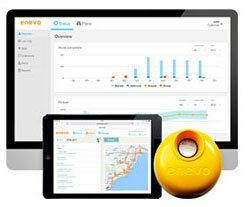 Enevo allows the customer to generate schedules and optimised vehicle collection routes. These are based on an extensive set of parameters made up from the data collected by the sensor. The optimised routes will help to reduce fuel and labour costs. Enevo will help to improve your customer service as the fill level monitoring shows you if a bin needs emptying more frequently. This will lower complaints of overflowing bins in high traffic areas as you will know about any issue before it arises. Using the more efficient collection routes will reduce fuel consumption overall and in-turn reduce vehicle emissions creating a positive impact on the environment. This piece of software provides insight into all of the bins data such as a nearly real-time fill level figure and fill level forecasts displayed using easy to read graphs and visual prompts. A driver focused piece of software perfect for in-vehicle tablets, it provides navigational guidance and reporting. It provides configurable daily collection schedules that use automated collection routing. When combined with Enevo Pulse you can generate optimised smart collection routes.